With more seniors choosing to maintain their independence and stay in their own homes for as long as possible, maintaining balance and fall prevention are important aspects of everyday living. 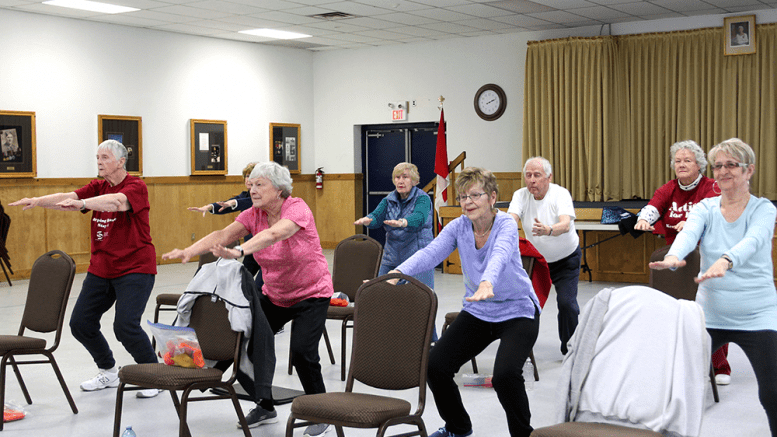 Centre de santé commaunitaire Hamilton/Niagara (CSCHN) is now using two Pelham locations to make its free Keeping the Balance program available to area seniors. They are the community centre and Royal Canadian Legion Branch 613. Even though the program has been running for six years in French, two years ago an English program was implemented and now runs in five Niagara locations. Keeping the Balance is an interactive informational and physical education program focusing on balance, strength, co-ordination, stability and posture. There are a variety of sensory activities participants do that also work on their tactile function, all of which are important in aiding in fall prevention. There are four components to the session, which are warm-up, balance, strengthening and stretching. Items used in the activities include marbles, chair, balls and bean bag. Some motions also incorporate various Tai Chi techniques. The participants are encouraged to perform the exercise with their eyes closed to simulate potential low vision in the future or in low-light or dark environments if they need to get up at night. This helps promote enhanced proprioception (the sense through which we detect the movement and position of our body) and vestibular systems (parts of the inner ear and brain which control balance and eye movement). CSCHN’s Coordinator of Primary Care Services Natalie McCarthy said hundreds of senior participants have seen the benefits of participating in the program. Since implementing the free service funded by the provincial government, McCarthy is hopeful they will be able to build on it. McCarthy said the program is adaptable and can accommodate individual abilities of all levels. Pelham resident Sharon Rodem joined the program in January due to her balance issues. Marjorie Tuck has been in the program since October. Since the CSCHN’s mandate is to provide health, social and community services in French, to improve the health and quality of life of Francophones in Hamilton and Niagara, McCarthy said this was a way to engage with the community and promote the non-profit organization’s multitude of educational resources and health services for all ages. The program accommodates a maximum of 16 participants and runs for 12 weeks. Currently, there is a waiting list for the English-speaking program at both locations. The next sessions at the Legion and community centre begin in April. Those on the waiting list will be given registration priority. For those who do speak French, there is no waiting list to enroll in the French program. For more information on the organization’s programs or to placed on the waiting list, call 905-734-1141.